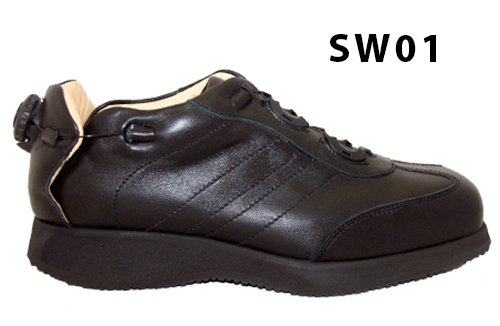 The SMART woman orthopedic footwear is designed for completely independent use by users of AFO, DAFO, orthoses and splints. Even those with reduced mobility or adhesion would benefit greatly by wearing this Easy Up model. Thanks to its tilted rear heel, you can fully open the shoe and, as a result, simply put your foot almost as easily as in a liner. The clever lacing system BOA of Easy Up then closes the heel and adjusts the shoe to fit perfectly to the foot. As a result, there are no pressure points on the instep that are common with laces and velcro. With the simplicity of its lacing system the user can adapt and fasten the shoe with one hand. Some Easy Up models have a rear dial, some have a side that is probably the best choice for wheelchair users or those with limited autonomy. The clever lacing system will make the shoe suitable as a glove. If there is still space to fill, you can use the spacers that come with shoes. 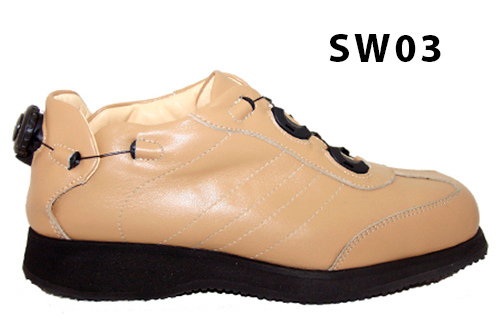 Survival walking shoes are also suitable for use with additional inserts (not included) to help stroke patients regain balance. A specific sole for women or men is provided. - FLEXY option for those who need the most flexible EVA sole. The Easy Up shoes are made to order, therefore the delivery can take from 3 to 5 weeks from the purchase.